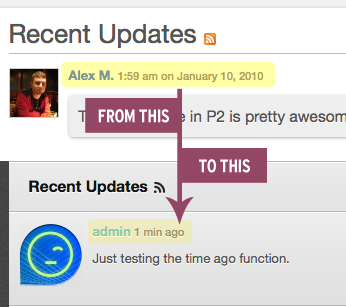 Very nice Chris, this might be the best implementation of this type of functionality I’ve seen. Kudos! Thanks Matt. One thing that I think can be changed is after a certain amount of time you show the actual time and date, because nobody wants to see “posted 124 days ago” on the page. Also, we could add some microformatting in as well. I’ve seen this done before but interesting to see the code behind it. Personally I would never use it though because I just don’t agree with the approach. I think people are smart enough to read a date and figure out how long ago it was. When it comes to articles some people want to cite other article sources via MLA or whatever format you are using. When you convert the date to how long ago the post was, it becomes hard to pull out the information easily to correctly cite that article or post. However, I would argue that when you’re reading status updates or even comments, sometimes it’s better to quickly see how long ago it was posted. Certainly, it’s not the right solution for the typical blog. Nice! Been looking for a way to do this with my twitter feed as well. I’ll have to have a play. Very nice, very simple, love it! Nice function. Thank you for this post. Cool post, I’ve added this elsewhere but for some reason never thought to do it on my own blog. I definitely want to try it now. I would partially agree with the comment on readability. I would suggest adding a line or two in the code to see if it’s greater than x days to start converting it back to the mmddyy format for readability as 6 weeks ago isn’t all that useful for most people. Also, you might want to only do this on the front page of your blog and in single posts display normal dates. Just some ideas. Thanks for posting. “Conversate” will be free? I hope yes because it is based on a free theme! Thanks Chris! I just swapped this out for the code I manually wrote…kudos! This tricks work on comment right? Yep, it works for posts and comments. This is extremely useful in WP sites with frequent updates and lots of comments. Sometimes it is better to see how much time has passed from the moment the post was published. Will be useful in some of our projects. Thank you. I guess I’m a little late to the party here, just finding this now! Kudos Chris! I’ll be using this on a client project currently in development. Cheers! Interesting, but I don’t wanna see “2 years ago”. How about limiting this to a max of 24 hours and everything else stays on default time stamp?